As a mom, life is pretty much unpredictable, no matter how much preparation and planning and organizing you’ve done! Even when you’ve laid out everyone’s things the night before, just getting out the door can be unpredictable. Like how suddenly the baby blows out their diaper and spits up at the same time so that you both have to change, the toddler throws a fit because they want to put their shoes on by themselves (and then throw a fit because they can’t do it), and the older two argue about who gets to walk out the door first (which is ironic, because there’s a sign on the door that reads “Mission: Love People”). Not much else is predictable about a mom’s day except that there will be a morning, afternoon, and evening. But because I know my tomorrow will have a morning, I prepare for it with coffee. I’m assuming you found your way here because coffee is a part of your morning routine, too. Maybe your evening routine. Whenever. Coffee is one of those things that is pretty great any time. My husband and I both love to drink coffee. We met in college and would escape to local coffee shops for most of our dates out (hey, “poor college kids” was a true statement for us!). My husband proposed in the parking lot of a coffee shop (and randomly had fireworks go off a block away at the exact time. Totally unplanned and no where near New Years OR 4th of July….say, what?!). When we got married we even had coffee beans as part of the table decorations as a nod to the role coffee played in our relationship. After going through four pregnancies, I started realizing coffee was upsetting my stomach. My post-partum self that was caring for a newborn was really excited to drink coffee, but every time I did the nausea got worse. Then I started making my own homemade cold brew coffee concentrate. Can be reheated, so cold brew doesn’t have to equal cold coffee if that’s not your thing! If you have a hard time tolerating coffee, this might be a good solution for you, too. It does take some forethought, since it needs to soak for 12-24 hours. Just don’t go, “I want cold brew RIGHT NOW” after reading this! You’ll need to wait until tomorrow. But then you’ll have it ready and can get the next batch ready for the next day (or the next week depending on how much you make!). Once you have your system in place, it will be riDONKulously easy and won’t feel hard at all. 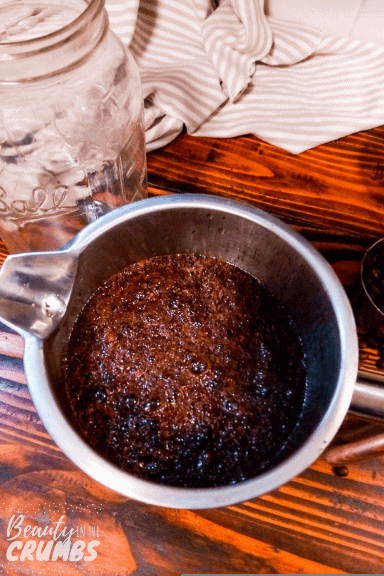 Cold brew coffee can be heated in a pot or in the microwave. I know I already said it, but it needs repeating. Because people ask me about this all the time. Or comment that they don’t like cold brew because they prefer hot coffee. 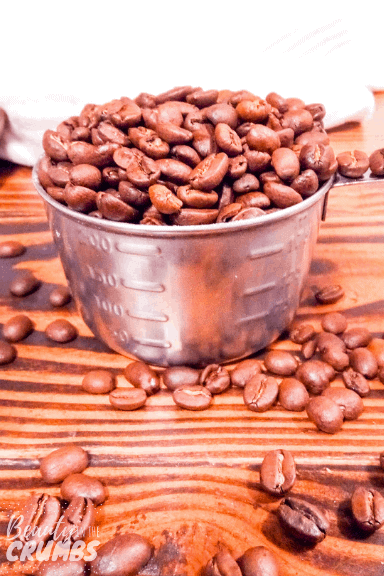 If you like your coffee hot, you can still enjoy cold brew coffee! Cold brew can be heated! It’s just the brewing process that uses cool water. And you probably want to keep the concentrate in the fridge after it’s done. That’s it. Cold brew does not have to equal iced coffee. 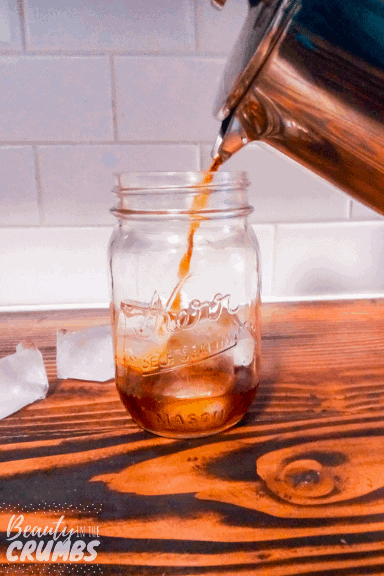 So, here’s the easiest way to DIY your own cold brew coffee! It’s almost too easy. It’s even easier than regular coffee in a French press. Note: I’m a relatively clumsy person, and I dropped a bowl on my glass French press once and completely shattered the French press. If that’s you, too, you need this French press! Note: This recipe can totally be doubled, tripled, halved, whatever, depending on your container size. The ratio you want to maintain is this 1 cup ground coffee to 32 oz of water. Pour room-temperature filtered water over the coffee grinds to the top and stir briefly. Place press on top to steap. Don’t press it just yet, girl! You gotta be patient. Press coffee as you normally would and enjoy your concentrate! You can drink it however you like! You can dilute it with hot water, cold water, or ice. If you’re a cream person, do that. How much should you dilute the cold brew coffee concentrate? 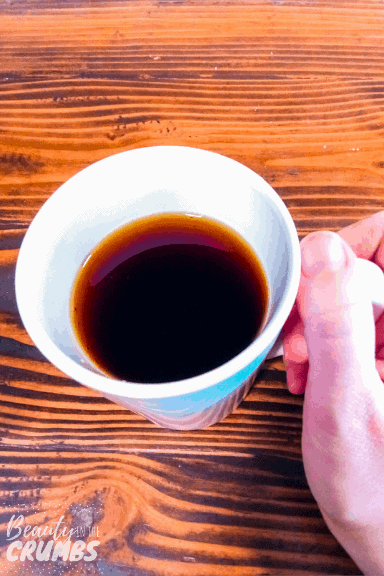 When you go to enjoy your cold brew concentrate, whether you drink it cold or hot, you’ll want to dilute it (unless you’re like my husband who doesn’t…I don’t know how he doesn’t). Buy hey, you can dilute it to your own taste! 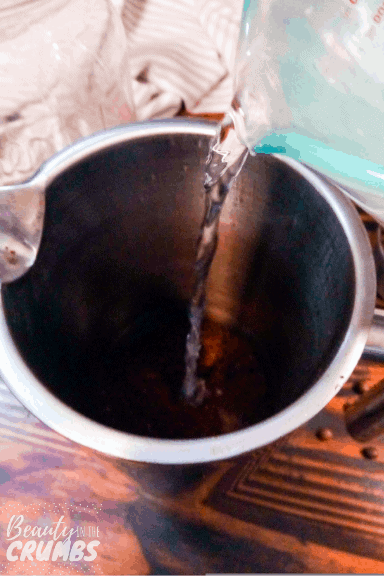 Start by adding 1/4 cup of water to 1/2 cup coffee, and add more water as needed. Or drink it straight up like my husband. It’s your coffee. Ain’t nobody gonna judge you. How long does cold brew concentrate last? It can keep for up to two weeks in the refrigerator. To store your left over cold brew concentrate, just put it in a container with a secure lid (like a jar or pitcher) and stick it in the fridge. In our house, though, it doesn’t make it longer than a couple days. For a great breakfast option to go with your coffee, check out these gluten free cranberry orange scones, or these vegan breakfast cookies. Don’t want to make your own? This brand is really good. I’d see if you can buy it in a store near you, since it’s more expensive via Amazon.